Compare these two pictures. One is from the D’Ma Hotel’s web site, showing a plush, pleasantly decorated room. 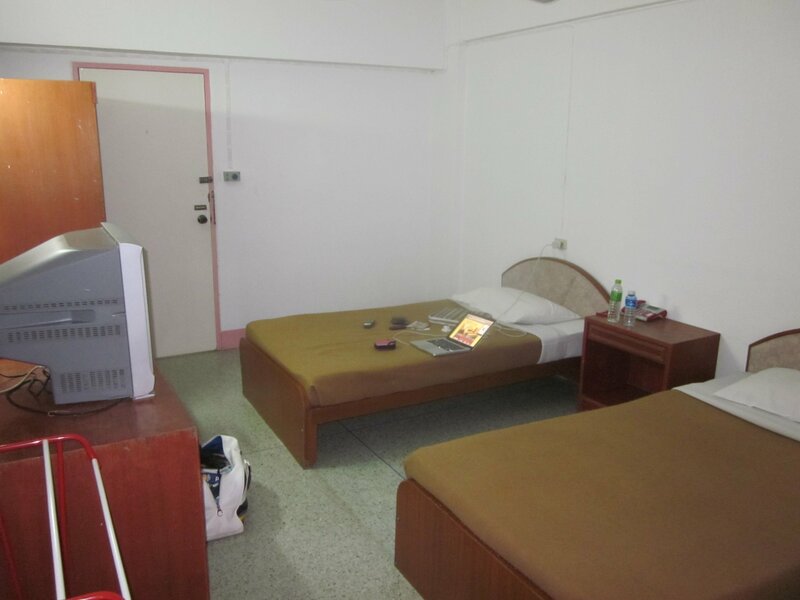 The other is the reality, the hotel in the flesh; nowhere near the most grotesque I’ve had the misfortune of staying in, but really nothing special either – just your slightly below average budget Thai hotel. The sort that, in the sort of upcountry location that Khon Kaen is, I would be happy paying 200, maybe 250B for – but not the 400B I forked out last night. It is in fact rather similar to places such as the Roma or Saen Samran hotels, nearby but indeed more centrally located, and indeed which manage to serve up rooms similar to the prices I’ve mentioned. Last September I had a very pleasant stay at the Pimarn Garden hotel, a boutique number and supposedly the (slightly pricier) sister of the D’Ma. Save for a few subtle shortfalls in service, the place was lovely, with the convenience of a hotel (in-room safe, fridge, TV, air-con, telephone, very well finished bathroom) but the atmosphere and ambience of a guest house. I would have liked to stay there again this time, for my very short one night stay in Khon Kaen, but, much like they told me last time that they didn’t have any of the cheapest 600B rooms available, this time when I called from the bus en route to Khon Kaen, they seemingly only had their most expensive ‘President’ suites – which rack in at 1,200B. So D’Ma was the alternative. As I’ve said, it is supposedly the budget sister of the Pimarn Garden, with practically identical web sites. If you believe what you read then it is cheaper because it is less centrally located, and because rooms lack a fridge and safe. They are still very pleasantly decorated, in what looks like much the same style as the Pimarn Garden. They still come with air-con and a nice bathroom, and the hotel still has free wi-fi for guests. Get there and it’s quite a different story. Picture two shows the reality of D’Ma Hotel; hard beds, the most basic of basic fabrics and a dull, unimaginative décor that certainly doesn’t lend itself with any ease to the word ‘boutique’. Add to that the fact that the whole place – corridors, doors, window frames, you name it – is painted in what is at once both a shocking and depressingly aged, dulled pink – and you begin to get a feeling for my disappointment when I reached my room. I had been hoping for something at least close to what I had enjoyed back at the Pimarn Garden last year; what I got could not have been further from it. The switch for the main light revealed itself to be hidden behind the television after a half an hour hunt in the dark, and dodgy electrics producing sparks from my charging laptop’s plug just behind my neck only added to the bargain. Another look at D’Ma’s web site is revealing. All those appealing photos of Pimarn Garden-esque rooms are, cites the little disclaimer towards the bottom of the page, of deluxe rooms. I was in a standard. At this point I felt and still feel three things. Firstly, that I had been cheated; if you are going to sell significantly different types of rooms, with accompanying significantly different levels of comfort, then fine – but put pictures of both on the web site, and let customers make up their own mind as to which to stay in. Don’t pull a con by tricking us into thinking we’re getting a plush-ish room when actually it’s a bog-standard basic one like we’ve all stayed in countless times before in dead-end spots across Thailand. Second, a wish that they had just told me they had more expensive, but more comfortable, deluxe rooms available. If their web site is to be believed (which I increasingly thing it’s not – but that is feeling three, still to come) then their deluxe rooms, at 480B, are only 80B more than the standard ones. That’s about £1.60, an amount I would have been more than prepared to pay to upgrade from the not-hideous-but-not-very-nice-either room I was in to something far, far nicer and, in any case, much closer to what I had thought I was getting in the first place. But perhaps my most residual feeling is that of disbelief and distrust. I visited this hotel last year whilst doing some guide book research; I don’t remember exactly what I saw back then, and I don’t have photos as my laptop died shortly after my last visit (hence this trip to take new ones to accompany the work), but the place garnered a good review from me so I don’t see that I could have been shown a room like this. Either things have really gone downhill there (really really downhill) since September, or I was shown a token deluxe room – perhaps they guessed I was reviewing, I don’t know. But I do not believe for one minute that they have a good stock of deluxe rooms in the same building as this grotty number. The two just don’t mix; why would you go down that route in business? Nor do I believe that a hotel that so actively seeks to con its would-be customers, by using pictures of one type of room to sell an entirely different, totally inferior room, deserves a positive review from me like the one I wrote them last year. So they won’t get it. I’ll be changing their review before I file my work – D’Ma Hotel has left a very bitter taste in my mouth, and it is one that they may live to regret. I can take cheap hotels that aren’t the nicest around, but I don’t like ones that try to con you. Just an afterthought. Two days ago I was staying in one of the nicest rooms I’ve had the pleasure of renting – at Chuen Jai House in Sangkhlaburi; a beautiful bamboo hut, very airy and with beautiful lighting. A very basic room; no air-con, just a fan, a mosquito net, a cold water stone bathroom and some of the nicest staff, who I’ve known for a little while already, anywhere. There are many people (I spent a couple of days with such people before heading to Sangkhlaburi) who wouldn’t expect a dead simple guest house with a cluster of bamboo huts to be more promising than a sturdy, concrete built hotel – but I would stay forever at Chuen Jai and not another day at D’Ma. Which just goes to show you shouldn’t judge a house by its bricks. Thanks for the comments Duncan, you’re clearly a fan of the place. I took the room on my own so I paid the full 400B – which I have no problem with of course, it’s as I would expect anywhere. Regardless of whether there are 30 deluxe rooms or not though (and I’m not doubting you – as I made clear in the article, I didn’t know for sure), I still think it’s out of order to use only photos of deluxe rooms on a web site you are also using to sell standard rooms – disclaimer or no disclaimer. It would be one thing to use a deluxe room as the main image, but to have an image of a deluxe room beside the text for a standard room is just plain deception in my book. As I said, it’s also rather against their interests for them to not even have mentioned the deluxe rooms when I phoned and again not to mention them when I checked in, since they could have very easily upsold me without much persuasion.